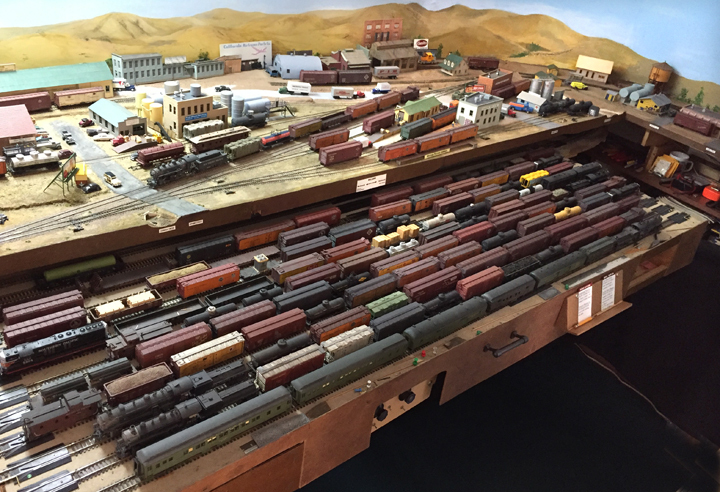 On March 4th last, I hosted an operating session on my layout. For the layout in its present form, this is the 29th session, as far as I can figure. As usual, I had four visiting operators, working as two crews of two people each. But very much not as usual, or at least not as previously done, I made a number of session changes. One was to operate in “timetable afternoon,” that is, as though we were on the prototype timetable but in the afternoon (previous sessions utilizing the prototype timetable were set during the morning). This of course altered the mainline trains that could pass on the Southern Pacific’s Coast Route. We then used “real time,” that is, actual 1:1 time. A second change was the use of my staging drawer, a transfer table I have described in previous posts, to operate an extra train of passenger equipment, baggage cars and deadhead Pullmans, in a westward direction, and also picking up and dropping off an express refrigerator car. The strawberry season is just beginning on the California Central Coast in early March, and this fruit is moving to eastern markets in express reefers. The photo below shows this train on the staging track nearest the bottom of the photo, with the Guadalupe local on the track just above it. 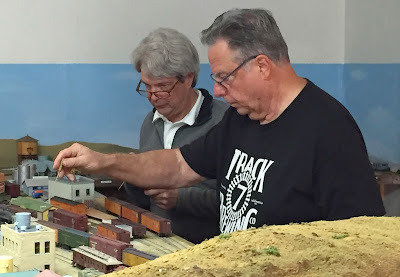 This was also my first invited session in which I put in place the “advisory” notices I copied from the example of Al Frasch’s layout (with Al’s permission; see that discussion at: http://modelingthesp.blogspot.com/2017/12/operating-with-sure-spots-part-3.html ). These simply clarify where particular cars are spotted at the industries requiring a “sure spot,” that is, spotting at a particular door or unloading equipment. The Ballard ones are shown below; you can click on the image to enlarge it if you wish. My crews this time comprised Larry Altbaum and Vicki Newcomer, who operated together, and Dave Stanley and Byron Henderson, the other crew. Shown below are Byron (at left) and Dave hard at work in Ballard, getting the first part of the switching duties completed. Byron, being a very experienced layout designer, naturally had a number of questions for me relative to the layout’s design, about what worked well and what I wished I had done differently, and they were thought-provoking questions. In fact, I am still mulling over some of them, and may write a blog post when the “mulling” is complete. 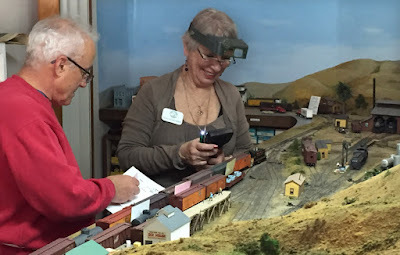 Meanwhile, Larry (at left) and Vicki were doing the car sorting that is an essential part of the Shumala switching. Vicki is a novice operator but is learning fast, and she enjoyed seeing this kind of intensive switching operation, as well as learning how it is done. Larry, as an experienced operator and also with prior experience on my layout, was an ideal mentor. The sessions went well and I was happy how the various changes worked. The crews did a good job, as usually happens, and I think everyone was entertained and had fun. And after all, that’s really the goal of all this. How old is my layout?